Today I am going to share with you a new recipe I tried out on Monday. 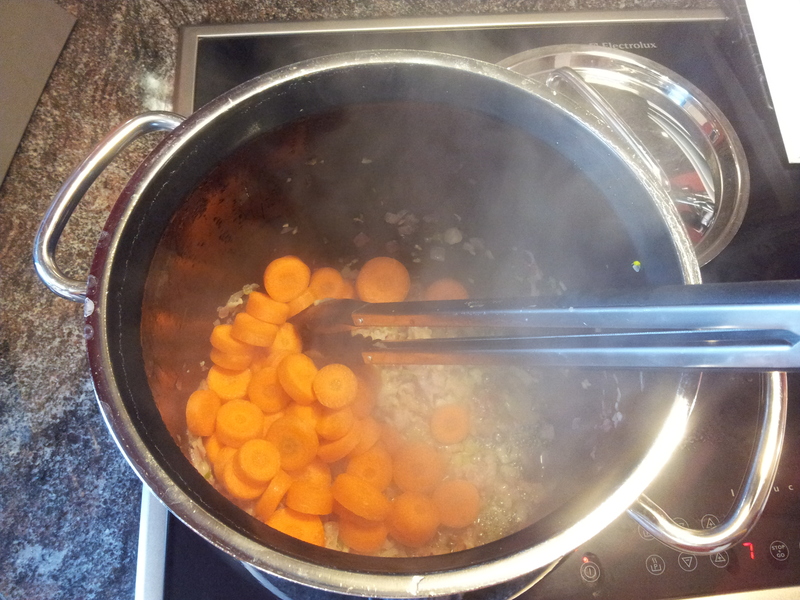 It is called ‘Minestrone’, or in German ‘Tessiner Gemüsesuppe’. But first a little background! Tessin, or in Italian ‘Ticino’, is the Italian speaking, Swiss canton, 3 hours south of where I live in Eastern Switzerland. Ticino lies on the Italian border, north of and very close to Milan. Ticino is one of the most unique and beautiful cantons in Switzerland. Hopefully, I can find some old photos of family vacations I have taken there, to share with you, soon!!! 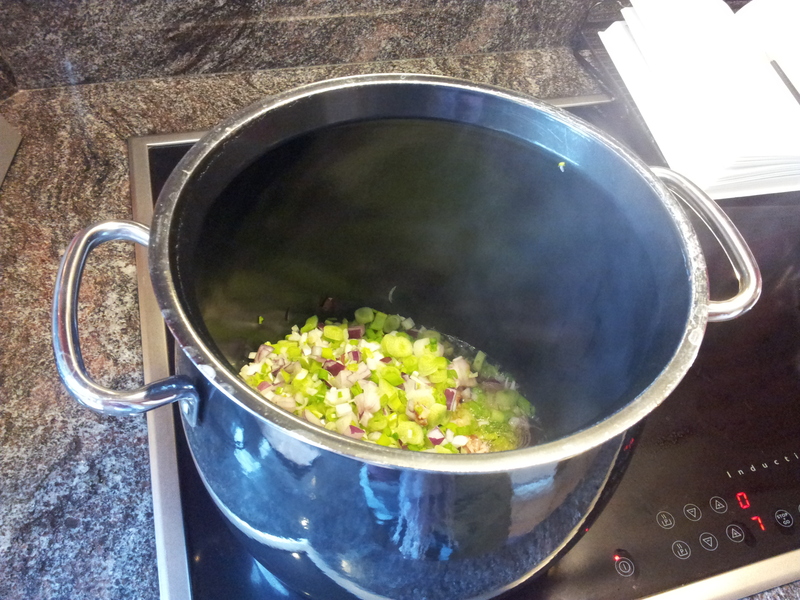 But enough with the Swiss lesson and back to the reason we are here… Minestrone!! 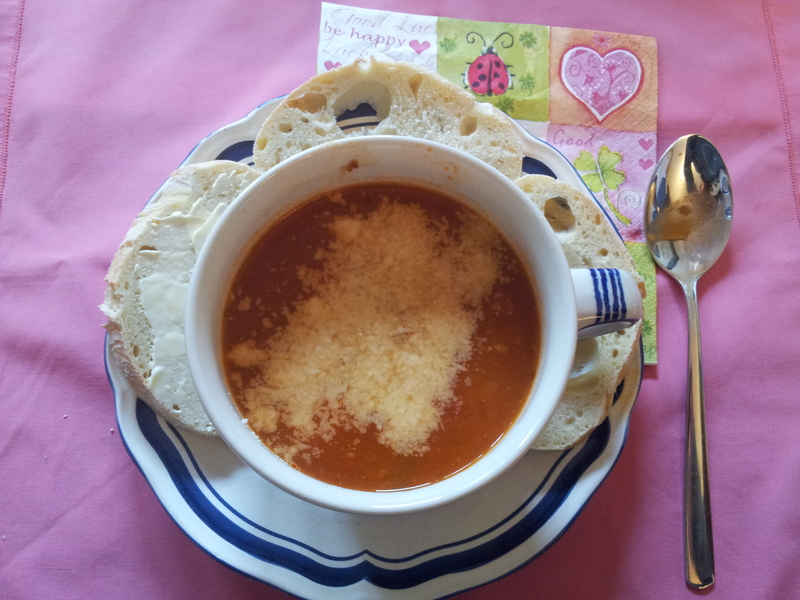 Unlike most of the Minestrone’s I’ve had, this recipe was delicious!! (And I promise, I am not being biased-loving practically anything Swiss!). That may be because I didn’t add, those things I don’t like in it (like beans), or maybe it was because it was 95% homemade! 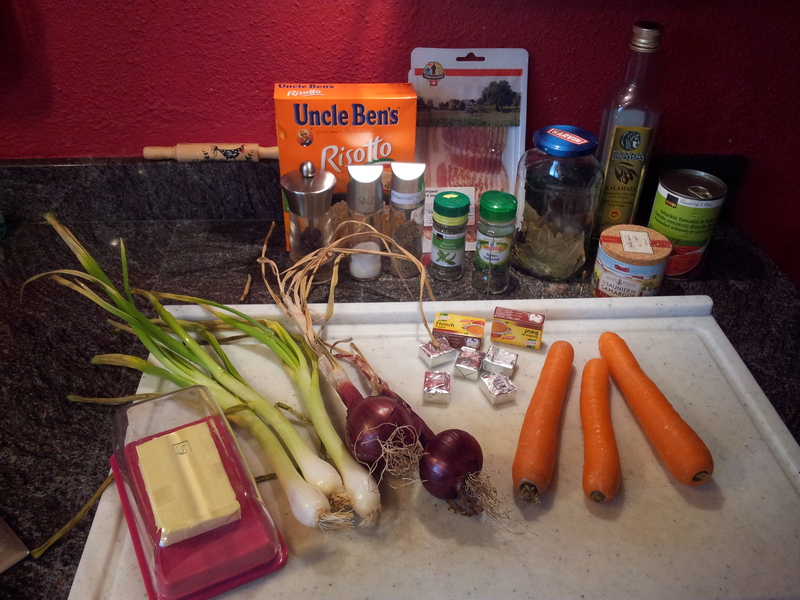 Ticino Minestrone Soup or because it is easier to say: Swiss Minestrone Soup! So on Monday, it was a blustery, cold September morning, and so I went in search of a nice vegetable soup to make for lunch. 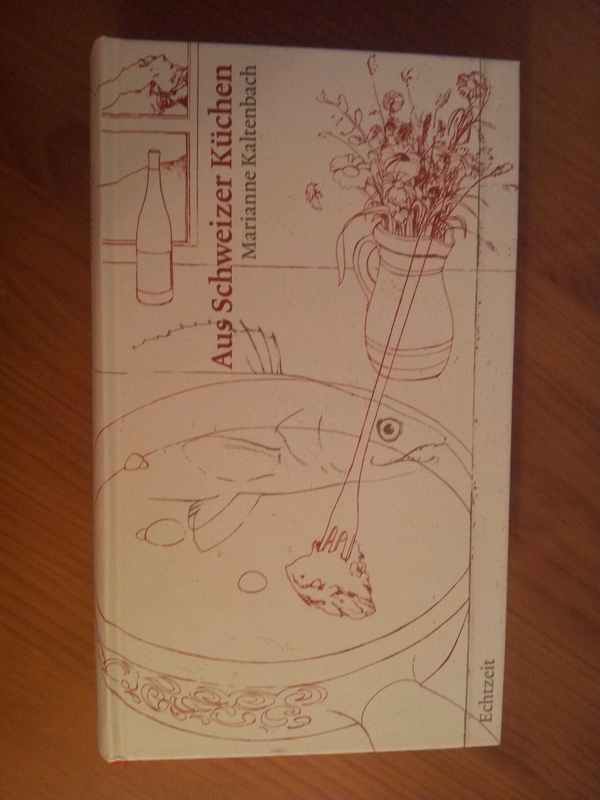 I found this recipe in this Swiss cookbook I have, by Marianne Kaltenbach “Aus Schweizer Küchen“. Marianne Kaltenbach is somewhat like the Julia Child of Switzerland, and this cook book is only somewhat smaller than Julia Child’s cook book Mastering the Art of French Cooking. It is a shame, but like many Swiss things, this book doesn’t seem to be available in English, but don’t worry I will translate the recipe as soon as possible and post it here! I love this cookbook and will tell you more about it in another post. 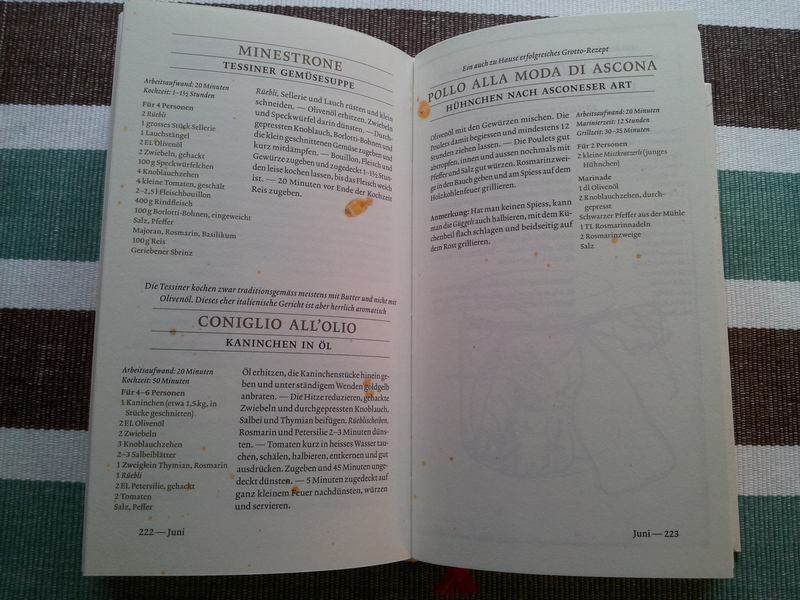 You can see my adventures in Swiss Minestrone making, resulted in me ‘Christening’ it’s lovely pristine pages!! So first of all I prepared all the ingredients on my big cutting board. I love that board, it is huge and so practical, if only I had the muscles to wash it and a deep sink to wash it in!! It is certainly one thing I couldn’t cook without! So after having read in Marianne Kaltenbach’s book, the lovely little tip, that they didn’t traditionally use olive oil in Ticino, I decided to replace the olive oil with my favorite cooking ingredient: butter!! This makes sense, because, of course the Ticino farmer’s – or housewife, wouldn’t have cooked with olive oil. As mild as Ticino is, it is still far too north and far too alpine, for olive trees to grow, but Switerland has no shortage of cows and fresh milk to make great butter! So replacing the celery and leaks with green (spring) onions (hubby doesn’t like celery), I sliced them up, fresh greens and all, and threw them in the pot together with the chopped up red onions. Then I added the chopped up bacon (not sure how much it was, a package, maybe roughly 100 grams, it was a lot in any case) and sautéed that along with the butter and onions. 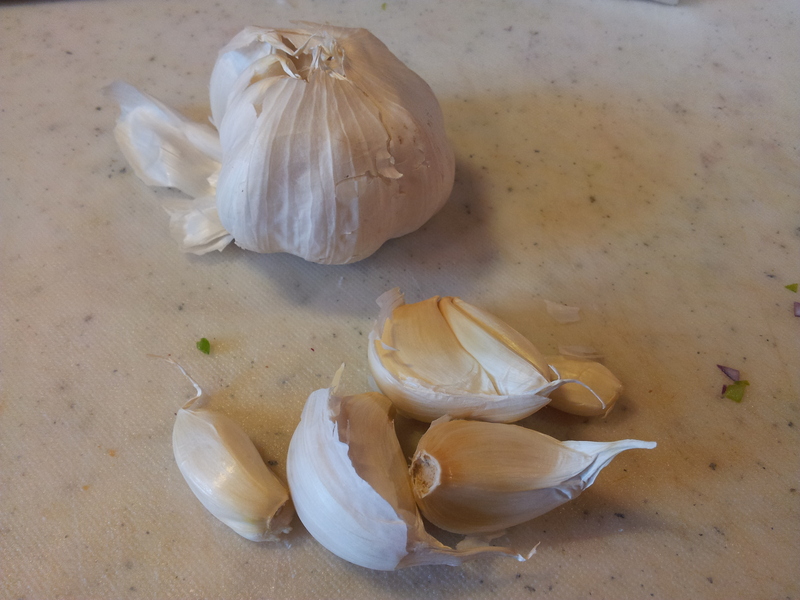 Next I added 4 pressed garlic cloves. Followed by the thickly sliced carrots and the two cans of chopped tomatoes and lightly sautéed them. I added ca. 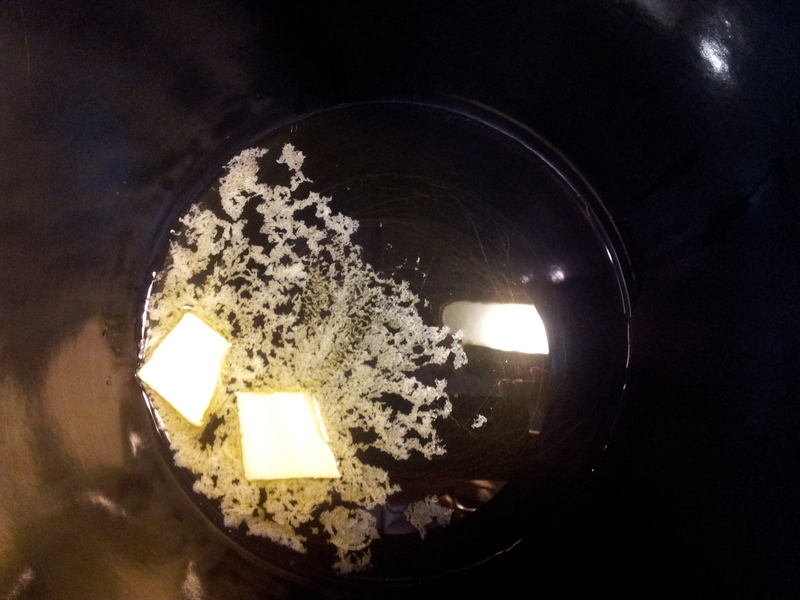 2.5 liters of beef bouillon. 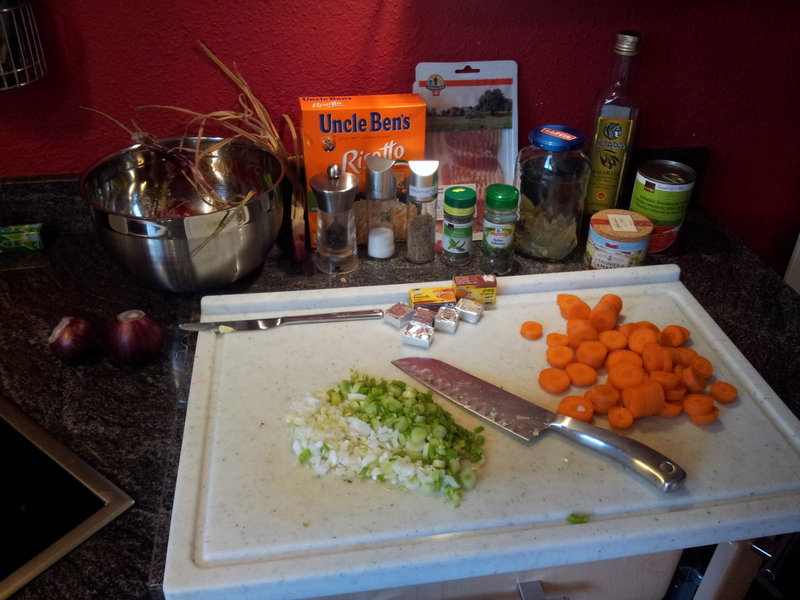 Here I was supposed to add 400 grams of beef, no clue what kind, but I imagine roughly chopped stewing beef. I didn’t have any, so I skipped that part. I also don’t think I will add it in the future as, the rich flavor added by the bacon, made it plenty flavorful and filling for me! Next, I seasoned the soup with equal amounts of salt and pepper (to taste) as well as Marjoram, Rosemary, and Italian Seasoning*. Here* I was supposed to use basil but I didn’t have any. I then covered the soup and simmered it for an hour and a half. Twenty minutes before the end of the cooking time I added risotto. As I didn’t have rice I thought this might be a good substitution and I was right. 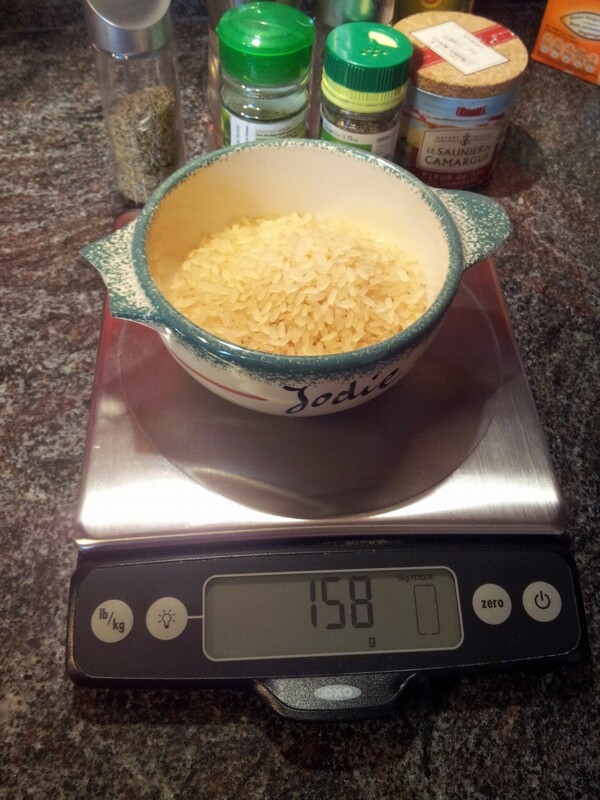 Finally, to add the final touches, I added grated ‘Sbrinz‘ before serving the soup. For those of you who have never heard of it, I am not surprised, as Sbrinz cheese, is Switzerland’s best kept secret. Sbrinz cheese is a hard cheese made much in the same fashion as the Italian Parmesan cheese. The result was fantastic. I don’t think I would change much if anything in the future. The bacon assured for a delightfully full flavor, the risotto thickened it and gave it substance, and the veggies chosen, both added a deliciously delicate, and yet, noticeably Italian (or Ticino) flavor. I guarantee that this soup will put you in the mood for the quickly approaching fall! When it is simmering away on the stove, its rich flavor will remind you of all those things you love about the season. I know many people think soup is a complicated thing to make, which takes too long, and so naturally the next best option is out of a can or package, but I beg to differ!! Soup is one of the most wholesome and satisfying meals you could make for yourself and while it may take time to prepare, ( and mostly, to cook), it is well worth it for all the delicious leftovers it makes. If you can’t eat it day after day, you could freeze and have it next time you are craving something hot and savory! So please if you don’t try making this soup I urge you to at least try making your own favorite soup from scratch or with the help of ready prepared broth. If you haven’t already guessed, let me say, that this Minestrone will be a frequent visitor to my table over the next fall and winter months. The translated recipe (well my version of it) will follow shortly, so I hope you return for it! P.S. If you have any comments, corrections or questions, please feel free to contact me or by leaving a comment on this post. Further information is provided in the links throughout the post in Bold italic letters like these. Remember I love hearing from my readers either way!